Bearish sentiment has taken hold of oil markets, with oil and gas companies having lost $1 trillion since oil began its latest slide. - The Wolfcamp has been one of the most important shale formations that has helped drive up oil and gas production in the Permian basin over the past decade. 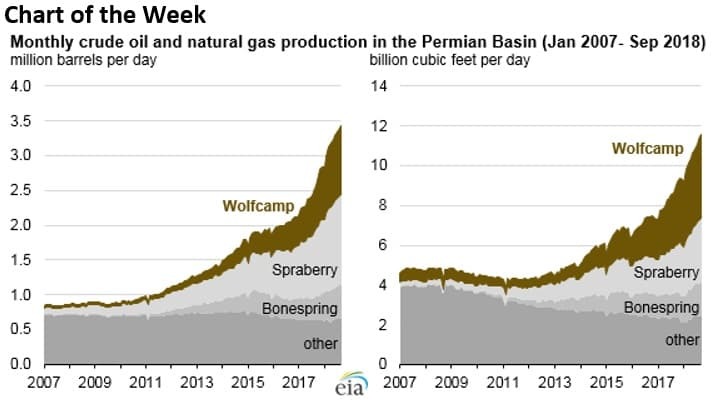 - As of September 2018, the Wolfcamp has been responsible for roughly 1 million barrels of oil production per day, as well as 4 billion cubic feet of natural gas per day (Bcf/d). - The Wolfcamp accounts for about a third of both oil and gas output in the Permian. • EQT (NYSE: EQT) was upgraded to a Buy rating by Goldman Sachs, up from Neutral, with a $23 per share price target. EQT jumped by 2 percent on the news. • Alberta Premier Rachel Notley said that “no option has been taken off the table” in response to the bottlenecks and price crashes for oil Canada. The statement referred to mandatory production curbs, which has been floated even by Canadian oil executives. The price discount for WCS is costing Canada $80 million per day. • Minnesota regulators reaffirmed their support for Enbridge’s Line 3 replacement, which would double the line’s capacity to 760,000 bpd. The project is expected to come online by late 2019 or early 2020 and represents Canada’s best hope of adding midstream capacity. Pipeline opponents are trying to stop the project in Minnesota. Hedge funds eliminate bullish bets. The bull market has now fully unwound after hedge funds and other money managers have sold off all the bullish positions they had accumulated since the second half of 2017, according to Reuters. The last seven weeks has seen the largest liquidation of long positions since 2013. Long positions are now at their lowest level since January 2016 – a period of time that coincided with the very bottom of the oil market cycle. Fund managers now have a roughly neutral position towards the market. Japan and South Korea could resume importing from Iran. Reuters reports that Japan and South Korea may begin importing oil from Iran again in January, having obtained waivers from the U.S. government. The two countries had virtually eliminated imports from Iran in recent months, but now feel that they have some space for buying oil once again. The waivers last until May. Oil majors focus on shale, but questions remain. The world’s largest companies continue to step up their bets on short cycle shale. BP (NYSE: BP) purchased shale assets from BHP Billiton (NYSE: BBL) earlier this year for $10 billion, while Royal Dutch Shell (NYSE: RDS.A), Chevron (NYSE: CVX), ConocoPhillips (NYSE: COP) and ExxonMobil (NYSE: XOM) have all previously announced aggressive plans to scale up production in the U.S. shale. But some of them have encountered problems, including write-downs in recent years. Medium-sized shale companies question whether or not the oil majors are equipped to perform well in short-cycle shale projects, a problem that S&P Global Platts explored. Oil and gas companies lost $1 trillion in oil price slide. The global oil and gas sector has lost $1 trillion in value over a 40-day period since October after crude prices fell by about $20 per barrel. U.S.-listed companies in the S&P 500 shed $240 billion. ExxonMobil (NYSE: XOM), for instance, lost $35 billion in value. Some analysts are warning that OPEC+ will need to cut output to balance the market. “If they don’t cut, I guarantee you it’s going to be 2014 all over again,” Mike Bradley, managing director at the energy investment firm Tudor, Pickering, Holt & Co., told the Houston Chronicle. Aramco abandons bond sale. Saudi Aramco abandoned plans to launch the world’s largest corporate bond sale, the proceeds for which would have funded a $70 billion stake in SABIC, the Saudi petrochemical firm. Previously, Aramco had considered a $40 billion bond sale for the acquisition, but has rejected the idea because of the financial disclosures that would be required for the sale, while officials are also worried about another market downturn that would affect interested in the debt sale. UK shale gas may not be economic. Caudrilla Resources has begun drilling for shale gas in the UK after years of regulatory delays, but has struggled with stoppages after seismic activity. The FT warns that Cuadrilla has another problem: Producing shale gas in the UK may not ever be economic because of ample supplies on the continent and a growing source of supply in the form of LNG from Qatar, Norway and the UK. Beyond that, renewables are steadily falling in cost, down 50 percent since 2013. Natural gas volatility bankrupts trader. Commodity-trading firm OptionSellers.com has fallen apart because of the violent swings in oil and natural gas prices. The firm apparently suffered a “catastrophic loss” by wrong-way bets on prices. Oil fell by 7 percent on November 13 and natural gas spiked by 18 percent on November 14. Individual investors, which apparently had to have made a minimum investment of $250,000, are set to lose their money. Cimarex Energy to buy Resolute Energy for $1 billion. Cimarex Energy (NYSE: XEC) is set to buy Resolute Energy (NYSE: REN) for $1 billion, combining two Permian drillers. The deal is illustrative of a wave of a consolidation underway in the Permian. Petrobras rules out privatization. The new head of Brazil’s Petrobras ruled out a privatization effort, although he supports ongoing asset sales to help trim the company’s debt. Protests in France over diesel taxes. The French government has hiked taxes on diesel in order to bring them up to parity with gasoline, which has been taxed at higher rate for years. However, diesel prices have been climbing around the world, in part because of the pending IMO regulations set to begin in 2020, which are putting a premium on diesel. The taxes are sparking outrage in France. Alberta considers refinery as WCS plunges. Prices for Western Canada Select have dropped as low as $14 per barrel, as pipelines carrying oil from Alberta are full. Alberta’s Premier suggested that they could build oil refineries in the province to help alleviate the glut. Some oil companies have already curtailed output because of plunging prices, and some executives have proposed the province issue mandatory production curbs. EVs to dominate battery market. By 2030, eight out of ten batteries sold worldwide will be used for electric vehicles, according to Bloomberg New Energy Finance. By 2040, about 55 percent of all vehicles sold will be EVs, BNEF estimates. Burn baby burn. The more big oil loses, the better I feel. They have stolen thousands from me. Thieves....plain and simple, thieves. The news that oil companies have lost an estimated $1 trillion since the oil began its latest slide over a 40-day period since October demonstrates the importance of high oil prices to the global economy. Yet the International Energy Agency (IEA) and its director claimed that any fresh cuts by OPEC to bolster the oil prices could have negative effects on the oil market. He and his organization must have forgotten the huge damage the 2014 oil price crash has inflicted on the global economy particularly the economies of OPEC members and the loss of hundreds of billions of global investments not to mention the cancellation of billions' worth of projects by the global oil industry. And despite the adverse impact of slumping oil prices on the global economy, it proves abundantly that US sanctions against Iran have so far failed to cost Iranian oil exports a loss of even one barrel. That is despite the fact that the global oil market has been bombarded for months prior to the sanctions by projections including IEA’s that the sanctions will cost Iran’s oil exports some 500,000 b/d to 1.5 million barrels a day (mbd). Furthermore, the issuing of sanction waivers to eight countries who didn’t need them in the first place and who would have continued to buy Iranian crude with or without the waivers is the clearest admission by the Trump administration that their zero option is out of reach and that sanctions are doomed to fail. Moreover, the eight recipients of the waivers have neither increased nor decreased their purchases of Iranian crude as a result of the waivers. I always like your comments and reasoning so thank you for all the posts. Just one question do you not think that $100 to $130 a barrel would be too high right now for the Emerging Markets in light of the high dollar to their currencies ? 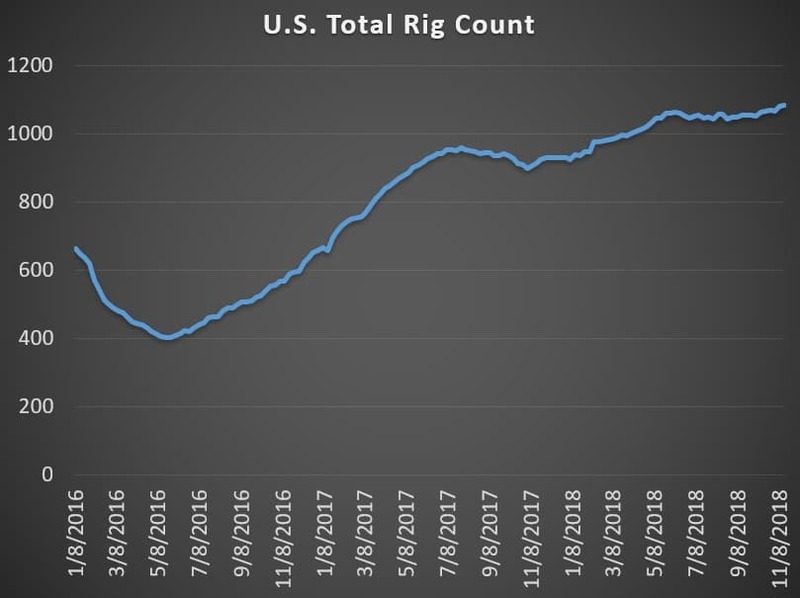 With respect, I don't think that what the world needs right now is an invigorated oil industry and further expansion of drilling operations. The industry has already been warned that most of that product must remain in the ground. It's best that these companies invest in alternatives instead of further drilling for a product that has potentially catastrophic long term consequences to society. Either way, oil prices are unlikely to go above $100 for any meaningful length of time again, unless the people in control of oil prices lose said control completely. If they do, alternatives will hasten their displacement of oil. These technologies are already cheaper (excluding energy storage) than fossil fuels in some sectors and circumstances and the transportation sector is now ramping up production of EVs and lowering the price within reach of far greater numbers of people. The oil industry, is unlikely to survive another decade of high oil prices as we more or less had between 2005 - 2014. By alternatives are you taking about battery powered electrics ? Why would you think in a world of constant inflation a finite resource would never reach a given $ value $100 in 50 years time will probably be the price of a few gallons of Gas let alone a Barrel of crude !